Heroin is a powerful, illegal opioid drug that has serious side effects, produces major addiction, and results in many negative consequences for the user. According to the National Institutes of Health, heroin use is up in the United States, with around 20 million people admitting to using this deadly drug. Repeated use of heroin changes the physical structure of the brain, and it also affects the brain’s function and physiology. Long-term imbalances occur in the brain’s hormonal and neuronal systems that are not easily reversed. With heroin use, studies show that there is deterioration of the brain’s white matter. This affects the ability to regulate behavior, decision-making abilities, and responses to stressful situations. Repeated heroin use almost always results in full-blown addiction. A chronic relapsing disease, addiction goes beyond physical dependence. It is characterized by psychological, uncontrollable drug-seeking behaviors that continue regardless of consequences. Heroin produces profound degrees of tolerance, as well as physical dependence. Tolerance occurs when a user takes more and more of the drug each time. With physical dependence, the body grows adjusted to heroin and adapts to the presence of the drug in the bloodstream. Because the body gets dependent, withdrawal syndrome occurs after 4-8 hours since the last drug use episode. Drug use is associated with loss of employment, and heroin is no exception. People who use/abuse this powerful opiate have problems functioning on the job, either due to the effects of heroin or the withdrawal symptoms. Heroin use leads to being fired, laid off, or quitting jobs, simply due to the severity of its addiction potential. Heroin has serious social and family consequences for the user. Heroin addicts often steal from friends and family members to fund their habits, or they cannot contribute financially, and become a dependent person in the friendship or family unit. This leads to resentment, anger, and conflict among the user and his/her friends and relatives. Heroin bought on the street often is mixed with other substances, some of which can be toxic to the body. Heroin users are at risk for lung, liver, kidney, and brain damage. These organs become permanently damaged from the substances mixed with the opioid drug. In addition, IV drug users and those who snort heroin are at risk of contracting hepatitis B or C or even acquiring the HIV disease. Because heroin is an illegal substance, being caught with it could lead to many legal problems and/or incarceration. A person using heroin could have a car accident, resulting in a vehicular assault or homicide charge. Because it changes thinking and behavior, users are at high risk for committing theft, assault, and/or homicide. Heroin users are in danger of fatal overdose, or many end up in the emergency room or hospital, barely surviving a respiratory depression. 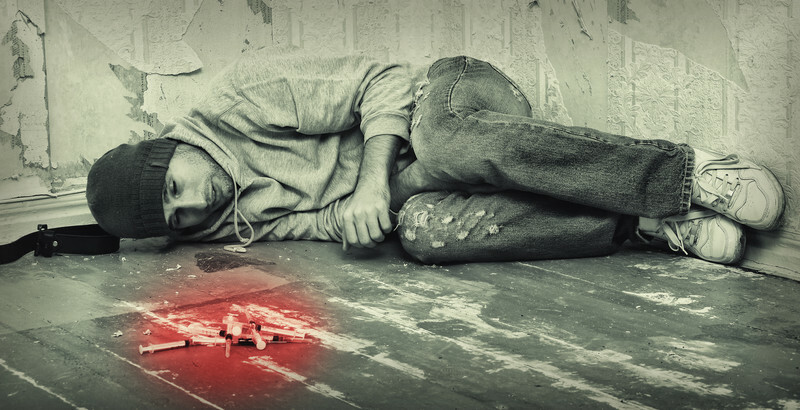 According to the National Institute on Drug Abuse, 11 Americans die every day due to a heroin overdose. Because the drug is majorly intense, users cannot tell that there is a problem until it is too late. Heroin affects a person’s breathing, and this drug slows breathing until a person no longer takes breaths.